There are few hobbies as rewarding as keeping some laying hens in the back garden. Not only do they amuse you with their antics, their gentle clucking is really quite therapeutic as well. And that’s before you even get those wonderful fresh eggs every morning! Financially, you make a small profit on the deal as well. Not as much as the commercial producers but when you compare the cost of eggs in the shop with what you spend on your own hens and feeding them, you do win on the deal. Raising Backyard Chickens – How Much Room? When you consider the tiny space battery hens make do with, you realise that hens do not need a lot of room but we want to give them as good a standard of living as possible. Hens don’t require a lot of room for sleeping so as a rule of thumb, a house just 3 feet by 2 feet will accommodate 4 hens comfortably, possibly 6 smaller hens. For a run they need about 6 feet by 3 feet for 4 hens. Obviously if you can let them run further and scratch about naturally then that’s great. Commercial egg producers get rid of the hens after a year and you can bag a bargain and give them a longer and much happier life. What is amazing is how quickly they respond to freedom and how friendly they are. They actually like your company and like being petted. Or perhaps they just associate me with food. You can get these via various charities or by approaching the farmer direct. Another source of hens at low cost are auctions. Watch out though, cockerels don’t lay eggs so those 3 hens may turn out not to be! 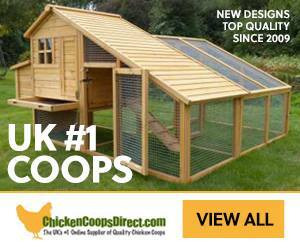 Of course you can buy a ready made hen coop or ark but there’s nothing to stop you building your own hen house cheaply. You can convert an existing shed if you have one spare. 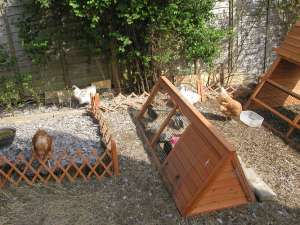 For some reason you can often buy rabbit hutches very cheaply and adapt them for chickens. 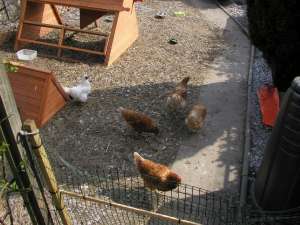 The broody ark in the photo on the right has growing chicks in and was bought as a rabbit hutch. It’s been strengthened on the outside by fixing weldmesh in case a fox gets in the garden. If you’ve got cats then don’t worry. The cats will soon forgive you and ignore these interlopers in their garden. Don’t trust them with chicks though. Small birds are a cat’s natural prey. Dogs are a different ball game. Some dogs will not be bothered and others will attack. You know your dog and how obedient he is.